At the upcoming SC18 supercomputing conference in Dallas, Texas, Purdue's booth will highlight how research computing resources are moving science forward in the four areas of Purdue's 150th anniversary theme "Giant Leaps": Space Exploration, Artificial Intelligence, Health & Longevity and Sustainable Economy & Planet. Mark Daniel Ward, professor of statistics, will speak in the Purdue booth (#1005) about his efforts to introduce undergraduates to data science as part of Purdue's Integrative Data Science Initiative at 10 a.m. CST on Wednesday, Nov. 14. His learning community, known as The Data Mine, is part of the 150th anniversary Ideas Festival theme, Giant Leaps in Artificial Intelligence, Algorithms, and Automation: Balancing Humanity and Technology. A panel discussion, "The Next 150 Years of Health, Aerospace, AI and Climate Change Research" will be held in the Purdue booth at 1:30 p.m. CST on Tuesday, Nov. 13. The panel will be led by Sandra Gesing, a research assistant professor at the University of Notre Dame, and Claire Stirm, a science gateway manager for HUBzero, Purdue's open-source platform for scientific collaboration. In addition to these talks, ITaP Research Computing staff members will be giving presentations about a variety of topics, including diversity in HPC, encouraging student success in cyberinfrastructure, supporting controlled unclassified information, research tools for geospatial data, and research sustainability. 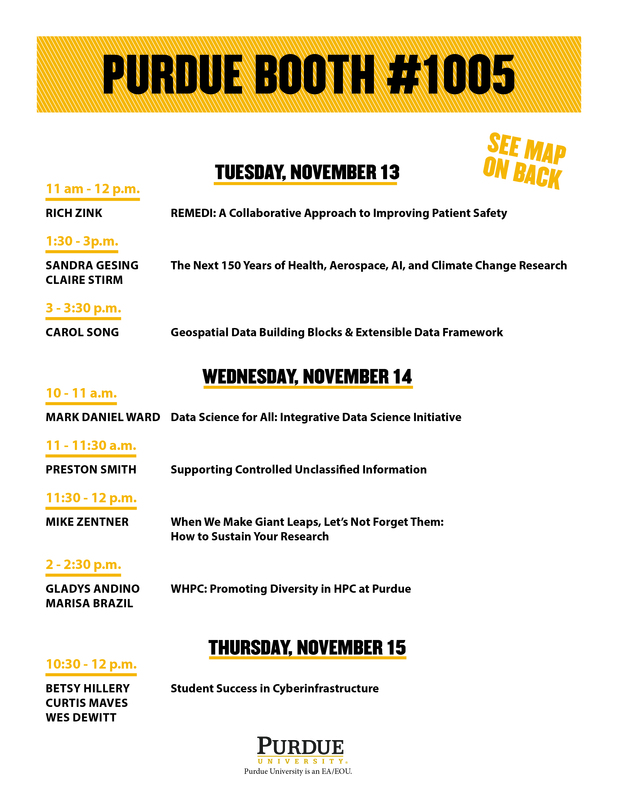 Here is a complete schedule of talks taking place in the Purdue booth. Purdue's team in this year's Student Cluster Competition is made up entirely of female undergraduate members of Purdue's Women in High-Performance Computing group. The team is known as Ada Six, in honor of the computer science pioneer Ada Lovelace, and is advised by Betsy Hillery, ITaP Research Computing manager for high-performance computing services. ITaP Research Computing staff will also be leading and presenting at a variety of conference sessions. ITaP Research Computing Principal Research Engineer Alex Younts and Scientific Applications Analyst Stephen Lien Harrell are the chair and program chair for the HPC Systems Professionals Workshop. In addition, Younts is a session leader for the Workloads and Benchmarks for System Acquisition Birds of a Feather (BoF) session, and Harrell is a member of a panel at the Reproducible, Customizable and Portable Workflows for HPC (Rescue-HPC) workshop, and he is presenting a paper on Effective Performance Portability. Preston Smith, ITaP director of research services and support, will speak the Dell booth (#3218) at 1:30 CST on Wednesday, Nov. 14, and at the DDN Storage booth (#3213) at 4:30 p.m. CST on Tuesday, Nov. 13. He will talk about how Purdue’s community cluster program and research data storage options have enabled over 200 Purdue faculty to take Giant Leaps. Purdue’s newest supercomputer, Gilbreth, is geared towards machine learning and AI. A number of Purdue faculty and staff served on the SC18 Planning Committee. Ananth Grama, professor of computer science, was a member of the Algorithms Committee and Vetria Byrd, assistant professor of computer graphics technology, was a member of the Scientific Visualization and Data Analytics Showcase. In addition, Harrell was the Exhibitor Forum Chair, ITaP Director of Data Networking Jeff Schwab was the Commodity Network Team Chair, and ITaP Research Computing Program Manager Marisa Brazil was a member of the Inclusivity Committee.